The Armory Center for the Arts is pleased to present Below the Underground: Renegade Art and Action in 1990s Mexico / Más abajo que el underground: arte renegado yacción en el México de los noven, a large-scale group exhibition in the Armory’s Caldwell, Mezzanine, and PAA Galleries from October 15, 2017 through January 22, 2018, with an opening reception, free and open to the public, on Saturday, October 14, from 7-9pm. Music throughout the evening will be DJ’d by the collective Sonido Apokalitzin. Below the Underground: Renegade Art and Action in 1990s Mexico / Más abajo que el underground: arte renegado y acción en el México de los noven is a group exhibition of twenty- six artists and collectives that examines social spaces and political actions generated alternative art practices, beyond the now-familiar independents toward diverse artist initiatives in Mexico City, Guadalajara, and Monterrey in the 1990s. Practices include ad hoc street performances and interventions, clubs, collaboratively produced ‘zines, archives and collections, pirate radio programs, and more. The project references pronounced divisions of class, race, and gender, with art objects themselves the tangible outcomes of many different conditions of creating, living, and experimenting within the same place. Below the Undergound also includes a publication and an interactive digital archive, described below. The project is the culmination of a year of related programs entitled #BetweenDownBelow/#EntreAbajoMasAbajo. Much of what is justifiably recognized as now-historically significant art from Mexico in the 1990s, while often critical of the European/US art historical canon, quickly became embraced by it. In contrast, the artists in Below the Underground were working in a manner exhibition curator Irene Tsatsos calls “radically local,” often in urgent response to conditions of the time. Many of these artists, while active cultural contributors in their cultural communities and cities, are lesser- known figures in the international art world. “I am fascinated by the work and actions in the so- called ‘margins,’ away from the widening art mainstream of the 1990s, by artists who operated there deliberately, engaging and responding to the larger cultural and political conditions of the time,” Tsatsos said. The 1990s in Mexico were marked by the collateral effects of social, economic, and political upheaval included rabid violence, industrial pollution, political corruption, border politics, the devalued peso, and a widening gap between the wealthy and the impoverished. Against this backdrop, artists created alternative spaces and situations to gather and show work, often with content that engaged directly with the politics and economics of these circumstances. These hyper-localized spaces and communities nurtured the most experimental practices of the time; influenced established cultural institutions to support art that was more expansive, ephemeral, and socially based; and generated dialogue among diverse communities and individuals who would otherwise not connect. The following artists and artist collectives are featured in the exhibition: 19 Concreto, Eduardo Abaroa, Mariana Botey, Casper, Caxa, El Chino, Andrea Ferreyra, marcelaygina, Grupo Incidental, Melquiades Herrera, Jalarte, Marcos Kurtycz, Los Lichis, Teresa Margolles, César Martínez, Sarah Minter, Taniel Morales, Lorena Orozco Quiyono, Pinto mi Raya, Vicente Razo/Museo Salinas, Elvira Santamaria, SEMEFO, Sonido Apokalitzin (represented by Vicente Razo and Luigio Figueroa), Katia Tirado, Ema Villanueva, and Lorena Wolffer. A related publication includes essays by Amy Sara Carroll, Michele Fiedler, Sol Henaro, Daniela Lieja, Lorena Peña, Selene Preciado, Alexis Salas, and Irene Tsatsos, along with interviews conducted by Michele Fiedler, Roberto Tejada, and Lorena Wolffer. In keeping with the project’s focus on aesthetic experiments, the book takes a dynamic alternative form and consists multiple elements within a single package. It includes a bound volume of original academic texts; an illustrated booklet that serves as an exhibition guide; and multiple loose-leaf special elements, including a silk-screened cloth inspired by the early clothing/costume design work of Mariana Botey, a CD with an exhibition soundtrack produced by Sonido Apokalitzin, a temporary tattoo from Museo Salinas, reproductions of selected exhibition announcements, and more. Commissioned texts feature discussions of art historic precedents (Henaro), the socio- political context of the 1990s (Carroll), women performance artists (Wolffer), a mythic, two-day event called Club Hipico (Salas), overviews of artistic innovation in Guadalajara (Peña) and Monterrey (Fiedler) in the 1990s, and interviews with artists and curators. The book was designed by Dante Carlos, River Jukes-Hudson, and Stephen Serrato of Ella, and is being distributed by RAM Publications (rampub.com). It has been produced with the support of Fundación Jumex. It will be available in January 2018 and will retail for $50. An interactive web platform, also designed by Ella, will complement the exhibition with content such as interviews, texts, and images generated through the four-year research process. Much of the content of this project was derived from conversations with artists and others who helped define the art scenes of the time. 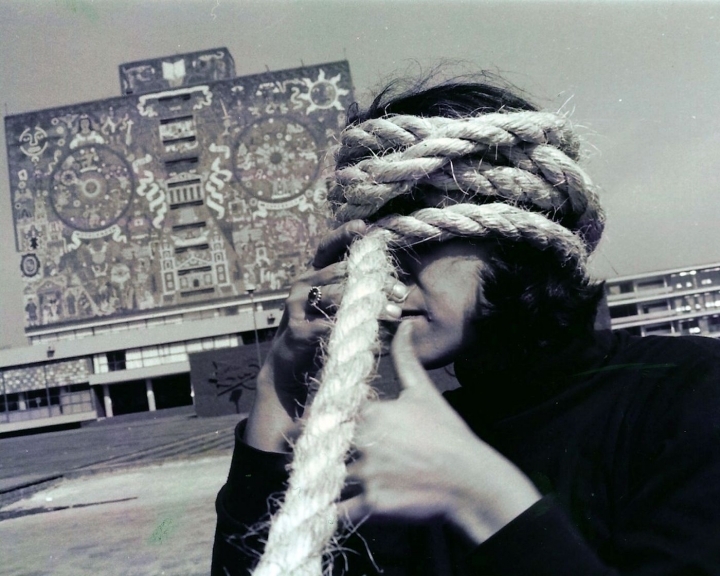 The interactive digital archive is another form of social space, an experiment that invites contributions from those participants and diverse others, with the goal of contributing to the growing historic narrative of Mexico in the 1990s and expanding the research conducted to date. The interactive digital archive can be accessed at www.belowtheunderground.org. The exhibition is accompanied by a resource room in the Armory’s Pasadena Art Alliance Gallery. The resource room features supplemental original source material, original objects and ephemera, and reference volumes such as publications about related exhibitions. Upcoming public programs include a conversation with exhibiting artist Mariana Botey and artist Rubén Ortiz-Torres on October 25, 2017; a reenactment of Ema Villanueva’s public drawing classes by Los Angeles-based performance artist Artemisa Clark on November 11 and in January 2018 (date TBA); and a performance by exhibiting artist and curatorial advisor Lorena Wolffer in January 2018 (date TBA). Details of additional programs, which are still being added, will be announced shortly through separate emails, on the Armory’s web site, and on social media, including the Armory’s Facebook page at https://www.facebook.com/armoryarts/ and Instagram at @armory_exhibitions and @armoryarts. Below the Underground is the third and culminating event in a series of exhibitions, events, and publications through 2017 – collectively entitled #BetweenDownBelow/#EntreAbajoMasAbajo – that emerged from extensive research in Mexico for Pacific Standard Time:LA/LA. #BetweenDownBelow/#EntreAbajoMasAbajo is a year of exhibitions and related programs with Latin-American and Latinx artists, focusing on themes of communication, individual agency, collective action, and social spaces generated by alternative art practices. With group exhibitions exploring the possibilities and difficulties of translation, reflections on Mexico in the NAFTA era, political graphic design throughout Mexico and Central America, an off-site exhibition with Los Angeles-based artist Carmen Argote, a special project with artist and designer Giacomo Castagnola, and a residency with the Los Angeles collaborative team Slanguage, the year highlights cohesive and international programming culminating in the presentation of Below the Underground: Renegade Art and Action in 1990s Mexico / Más abajo que el underground: arte renegado y acción en el México de los noventa. Pacific Standard Time: LA/LA is a far-reaching and ambitious exploration of Latin American and Latinx art in dialogue with Los Angeles taking place from September 2017 through January 2018. Led by the Getty, Pacific Standard Time: LA/LA is a collaboration of arts institutions across Southern California. Through a series of thematically linked exhibitions and programs, Pacific Standard Time: LA/LA highlights different aspects of Latin American and Latinx art from the ancient world to the present day. With topics such as luxury arts in the pre-Columbian Americas, 20th century Afro-Brazilian art, and boundary-crossing practices of Latinx artists, exhibitions range from monographic studies of individual artists to broad surveys that cut across numerous countries. Initiated through $14 million in grants from the Getty Foundation, Pacific Standard Time: LA/LA involves more than 60 cultural institutions from Los Angeles to Palm Springs, and from San Diego to Santa Barbara. Pacific Standard Time is an initiative of the Getty. The presenting sponsor is Bank of America.